Marquette University has a motto: “Be the Difference.” Martin J. Greenberg is the embodiment of that motto and has made an incredible difference at Marquette University. In 1989, Greenberg created the National Sports Law Institute at Marquette University Law School. He not only helped to build the area of sports law into a recognizable academic level but also helped make the Marquette University law program the best and most comprehensive in the United States. 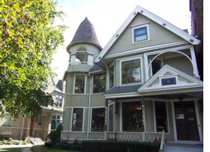 During his time at Marquette University Law School, Greenberg has become a respected authority in the area of real estate, sports contracts, and sports facility development. He has lectured extensively on those subjects nationwide. Greenberg has published numerous articles for Marquette University, including those in For the Record: The Official Newsletter of the National Sports Law Institute, the Marquette Sports Law Review, and on Marquette University’s NSLI website, Greenberg’s Coaching Corner. The article below is from the Spring 2015 edition of Marquette Lawyer. 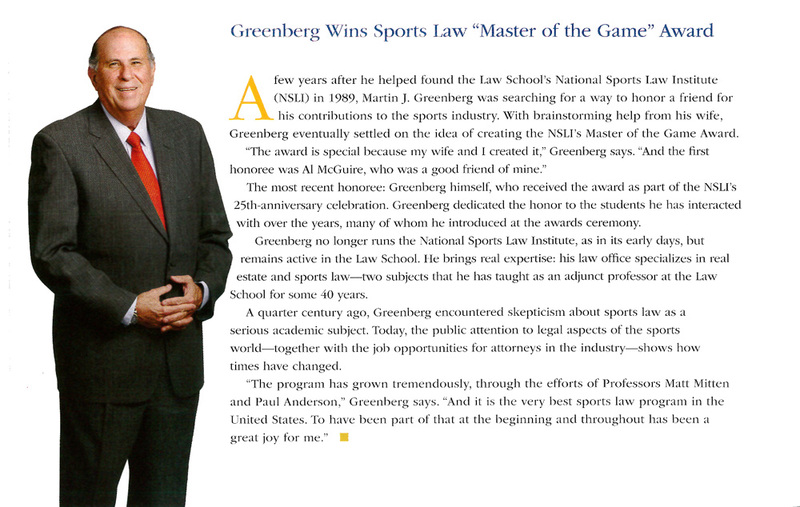 Martin J. Greenberg was the 2014 Recipient of Marquette University Law School National Sports Law Institute “Master of the Game” Award. In honor of Greenberg’s contributions to Marquette University Law School, the law school has created the Martin J. Greenberg Award for Excellence in the Study of Sports Law. The award was created in the fall of 1997 and is given annually at graduation to a third year law student who has both excelled in the study of sports law and service to the sports law program. Greenberg has also developed, while at Marquette, the area of sports facility development and teaches the only law school course on that subject matter in the country. The Greenberg Family created the Martin J. Greenberg Venue Excellence Award which is given annually to a student in the “Sports Venues: From Election Day to Game Day” Seminar taught by Greenberg for their performance in the class and their contribution to the Sports Law Program at Marquette University Law School.